Maybe it's patriotic bias, but I have always loved American History. I always get chills when I think of our Founding Fathers (and Mothers). Forget about the politics of starting a new nation, just the though of leaving behind everything familiar in the hope that things would be better here in America. Or those who settled the west, in search of being more than they could along the Eastern seaboard. 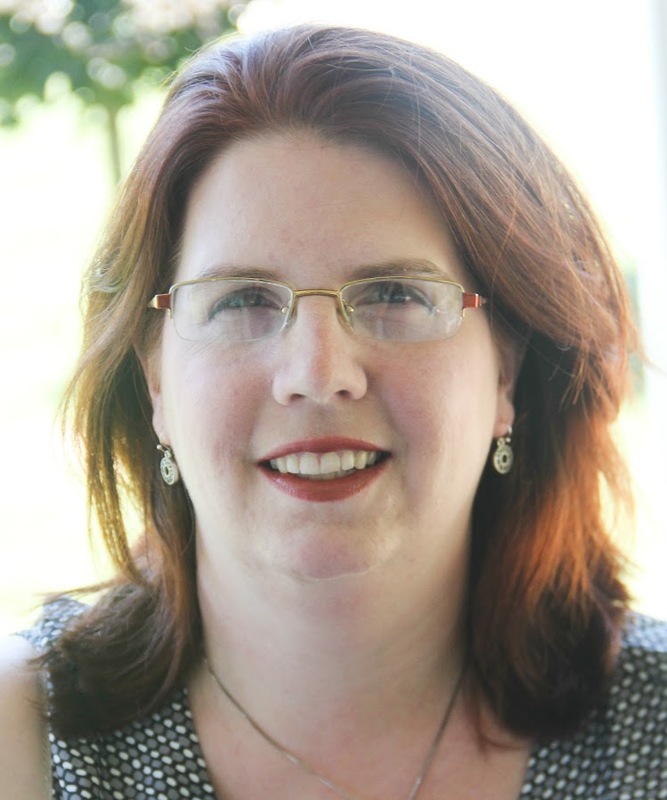 When I got married, I moved an hour from my parents, and it was hard. I can't imagine moving to another continent, or even across the continent, knowing I'd be saying good bye probably forever. I'd like to think it's due to my high school US history teacher. He taught with such a passion that he made the Revolution come alive to me. The timing of Luke coming home for school couldn't be better - he finished World Geography in school, so that meant US History was on deck. (This is fine by me -- as much as I love American history, World History is NOT my cup of (poured-in-the-Boston-Harbor) tea!) We live in the suburbs of Philadephia - less than an hour from Indepence Hall, two hours by plane from Boston, MA, and a three hour ride from our Nation's Capital. This area of the country is rife with American History. However, just going to these places doesn't give you an appreciation of why George Washington led a bunch of ragtag soldiers on Christmas night across a likely swollen Delaware river, or an understanding of the gravity of Lincoln's speech on the field at Gettysburg. We were going to need something to give us the backstory. The laws of this nations were founded on the words, "We the People." 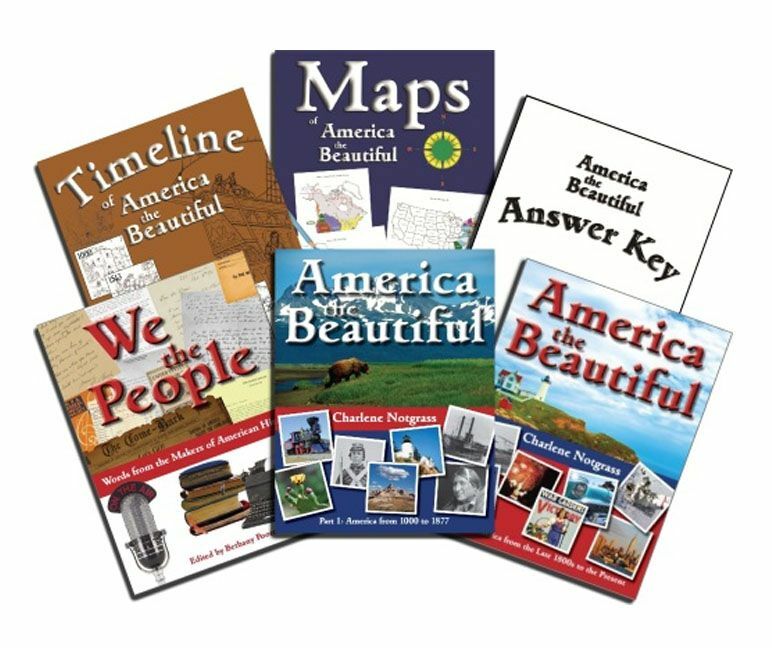 Notgrass Publications has created a program that integrates textbooks, map skills, and historical documents to create a complex study of American history that hightlights, "We, the people." The two-volume textbooks of America the Beautiful ($99.95) start not with the first European explorers, but with the very first American inhabitants. First, the animals that lived in the huge range of topographies of the land, then the people that would later be called the "Native Americans." Rather than waiting to learn about the Native American tribes as the settlers find them, this program puts them first in the studies - which makes sense because they were here long before Erikson and Columbus. Once the explorers start coming, the program does not turn into a narration of a timeline. We learn about things like the history behind the Cliff Palace of Mesa Verde, a Pueblo ruin, and the landmarks of St. Augustine (Florida), the first Spanish settlement of the new world. I remember visiting St. Augustine as a teen, and being incredibly bored. Some of it could have been teenage angst, but I am willing to bet that it was because I didn't "get" the scope of its history. There is the Castillo de San Marcos - one of the big tourist attractions - that is the oldest stone fort still standing in the US - but also the Hotel Ponce de Leon, built by Henry Flagler and designed by the famed Louis C. Tiffany -- the people. Many of the chapters have accompanying "family activities." Chapter 19 of the text features the Wright Brothers and the first airplane, and the activity studies the airplane with paper ones. Unit 11 focuses on the bayous of the Mississippi, and the activity includes directions and recipes to reenact a Natchez plantation dinner. Unit 20 includes a focus on the Jewish and Italian immigrants to the United States. Several of Neal's ancestors, Giuseppe and Vittoria Falciani (of Italy) and (Ashkenazi Jewish) Simone and Ida Cartun were among the thousands of these immigrants who were processed at Ellis Island. Chapter 20's Hamentashen recipe is very similar to the one we make at Purim. Our recipe is the one Ida's daughter, Freida, passed on to her own daughter Charlotte - my children's great grandmother. These activities highlight that our country is what it is today because of her people. This program gives you not just a living textbook and beautiful illustrations, but an incredible number of doors to open to explore the people. There is also an anthology entitled "We the People." It begins with the words to the hymn, "America the Beautiful," and contains a plethora of inclusions. There are presidential speeches - the text of Lincoln's inspirational "Gettysburg Address", and a transcript of one of FDR's famed fireside chats - the resigned yet inspiring Declaration of War with Japan, broadcast two days after the Attack on Pearl Harbor. It also includes writings I never knew of - yet the inclusion is so appropriate. There are memoirs of a Sioux man, and a 1958 letter written to President Dwight Eisenhower. Who was the author of a letter that stood out from all the correspondence Ike received? Jackie Robinson, number 42 for the Brooklyn Dodgers -- the man who broke the color barrier in Major League Baseball. We see President Bill Clinton finding himself on a different, yet no less painful, battlefield from President Lincoln: the Oklahoma state fairgrounds after the April 1995 Oklahoma City Bombings. Yet as proof that the American spirit never wavers, the last line of his address to the survivors and families echoes the words of his predecessor Lincoln: "...their legacy must be our lives." 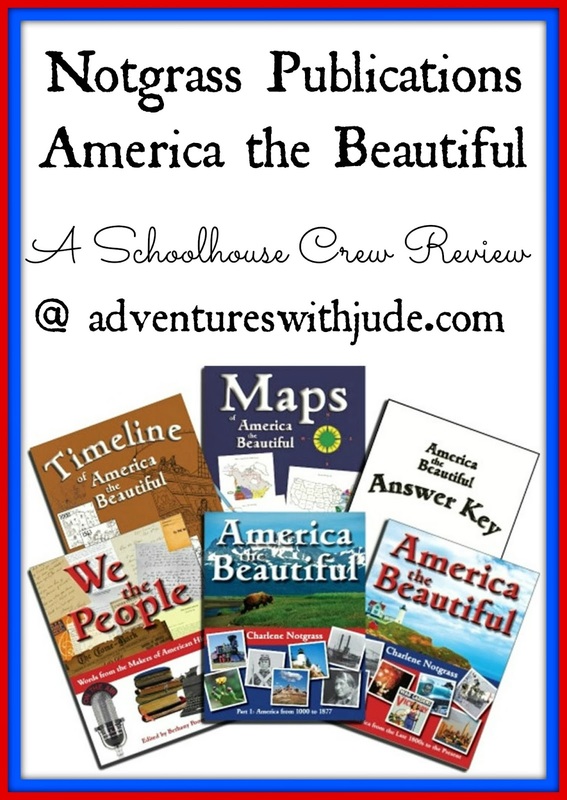 Although we did not use it for the review, there is an America the Beautiful Literature Package. This is ten works of literature assigned to help increase an understanding of the era being studied. This package includes The Sign of the Beaver, Bound for Oregon, and Homer Price. While I don't think they are sufficient to count as a full English course, they certainly go a long way toward creating one. Finally, the program contains both Maps and Timeline workbooks. (These come with the package, but are consumable. New ones can be purchased for additional students, they are $8.95 and $6.95, respectively). The maps are sufficiently detailed for learning, yet not overwhelming. 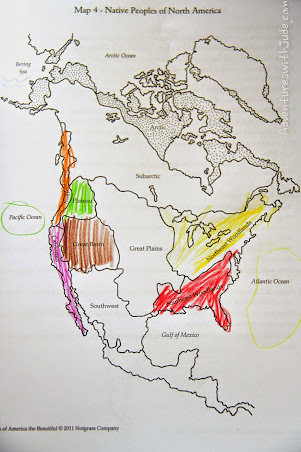 Many also contain multiple lessons - for example, Map 4 - Native Peoples of North America - is the focus of lessons 2 through 5, then revisited in lessons 8, 38, and 95 - giving the student the ability to form a base, then add on and review, rather than giving him an overwhelming amount of information at once. (Considering my brother is fairly correct when he teases that I can't find my way out of a paper bag with both ends cut off, even if I was handed a hose, I like the "baby steps" way of learning.) The Timeline begins with the year 1000 and has blocks that demarcate 10 year increments through 1500 AD, and then transfers to 1-year increments to add historical information to the year it occured. It has some pre-filled data (ie, 1492 and Columbus' voyage) and some for the student to add ("1507 - A map is published in Europe that gives America its name"). Again, the Timeline holds not just key facts like the year of Columbus' voyage, but information about the building of this country - "1828 - John Jacob Astor's American Fur Company establishes Fort Union Trading Post, " and "1925 - The Grand Ole Opry radio show is first broadcast; First National Spelling Bee is held; Alaska's Glacier Bay National Monument (later National Park) is established." Our country is so much more than the traditionally studied dates of wars and presidencies, but they often are forgotten in general history books. The United States is not static. Between narrative texts, hands-on activities, historical writings, and evolving maps, this series underscores this as it brings the history of our nation to life. While this text is really geared to the middle school level (a one year study for grades 5 through 8), it is definitely usable as a base for Luke's two-year high school program. Our plan is to use this as a base, and explore brief mentions more deeply. I see a study on Tiffany glass, a study of FDR's fireside chats and JFK's televised campaign, and learning about the evolution of American music in our future! 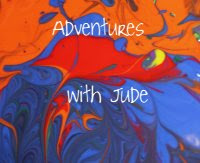 We've already started a blog series, Luke's American Adventures to share what he has learned. (Our first installment was a comparison of the lives of the immigrants discussed in the first chapters of the program.) The constitution of this nation begins "WE THE PEOPLE," and this curriculum gives life to that document, highlighting not just the events but also people that made us into what we are today. 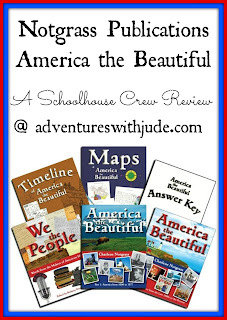 While we reviewed America the Beautiful, other crew members were trying out Notgrass Publications' Draw to Learn. Click on the banner to find out about both great programs.